Julie & Julia opens tomorrow and this is one movie I am definitely going to see on the big screen. I don't know Julie from a hole in the wall, but Julia and I are old friends. 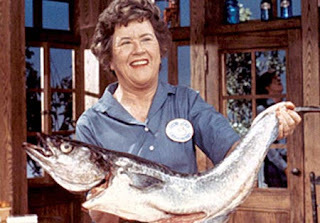 She was the culinary icon of my youth. Before Julia, cooking in America was all about jello salad and casseroles featuring a can of condensed cream of mushroom soup. French cuisine was frighteningly foreign and vaguely decadent. Then came Julia Child. She burst onto the scene through our black and white TV screens, initiating us into the mysteries of coq au vin and chateaubriand. Her show, The French Chef, was de rigeur viewing for every upwardly mobile young woman in the 1960's and 70's. Well, that is except for the ones who were wearing flowers in their hair, living in communes and tripping on acid. I was given a copy of her two volume opus, Mastering the Art of French Cooking as a wedding gift. Everyone was. Julia opened a whole new world to me. She taught me how to cook. She was my mentor. She saved my life when my mother in law came to dinner. Unlike Julie, I didn't go straight through from beginning to end, but I learned how to make a dynamite Cassoulet and mastered mousse au chocolat. Julie was more thorough than I, but we are sisters under the skin. We both made friends with Julia through cooking with her. For me, in those days, just cooking with wine was exotic. Who knew that a marinade would tenderize and flavor cheap cuts of meat so delicately, or that asparagus should be peeled and cucumbers seeded. I was amazed to find that I could make my own mayonnaise in the blender.... oh what a thoroughly cutting edge, sophisticated young woman I was. No more cream of mushroom soup for me. My eyes had been opened and there was no going back. My adventures in cooking came to a rather abrupt halt with the birth of my first child. Elegant meals took a back seat to just getting through each day and dreaming of an extra hour of sleep. Julia went back on the shelf and out came Dr. Spock. But by then I had learned the basics and it was Julia, not my mother who had taught me. Julia and I had bonded, as only two women cooking together can, right there in my kitchen. Mastering the Art( as we called it for short) still sits on a shelf in my kitchen. I don't use it much anymore, but just having it there gives me a warm feeling. It brings back a time and a world now vanished, and like the woman who wrote it, it is a treasured friend. I can't wait to see the movie. Yes, JC really paved the way for young wives all over America to throw away the canned mushroom soup! btw, there's a *wonderful* article about Julia and husband Paul in this month's Vanity Fair. If you haven't read it, you're missing a treat! I'm so excited to see this film, too. Being a woman 'of certain age', I also got to enjoy Julia in the kitchen via TV. Her enthusiasm over the enjoyment of food was a gift, which she shared generously. Really great blog article! I really enjoyed it. I cook chicken and vegetarian too. I vacillate between the two!